Portland dropped its series opener at Hadlock despite the efforts of top prospect Michael Chavis. Chavis was 4 for 4 with an RBI, his first four-hit game since last August. The 2014 first-round pick raised his line since rejoining Portland from .196/.328/.411 to .250/.366/.450. Tate Matheny and Jeremy Rivera had two hits apiece for the Sea Dogs. Matthew Kent took the loss, allowing five runs on 10 hits in 5 1/3 innings. A monster game from CJ Chatham and an outstanding start from Jake Thompson led the Salem romp. Chatham homered, doubled, stole a base, and drove in four runs as part of a 3-for-4 evening. The 2016 second-round pick went deep for the first time since May 22 as he broke out of a 3-for-21 skid. Thompson turned in one of his strongest starts as a pro, firing six scoreless innings. He gave up just four hits and walked one while striking out four. Brett Netzer doubled as part of a 2-for-4 evening, scoring two runs. Despite a tough loss, it was another positive development for Pedro Castellanos, who had a double as part of his third consecutive multi-hit game. The first baseman sported just a .592 OPS at the All-Star break but has hit .326/.355/.417 in 34 games since. Starter Jhonathan Diaz struggled, allowing six runs (five earned) in 4 1/3 innings. Diaz struck out five and walked two, and now has 121 strikeouts against just 32 walks on the year. The finale of the four-game set was suspended by rain in the top of the fourth inning with Lowell trailing 4-1. The game will resume when Vermont returns on August 23rd, followed by the regularly-scheduled contest. 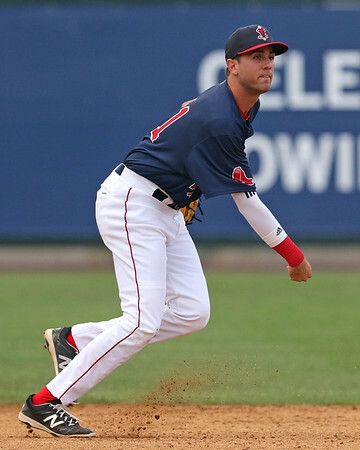 The GCL Red Sox paired eight hits with eight walks to hold onto a share of first place. Keibert Petit delivered the decisive blow, a three-run fifth-inning homer that put the Sox in the lead for good. Along with his first round-tripper of the year, Petit also walked twice. Jecorrah Arnold had a pair of doubles, and Juan Carlos Abreu compiled three hits. Gregorio Reyes got the start and turned in a strong perfomance, giving up just one hit in three scoreless innings. A late rally fell short for the Sox, who trailed 7-2 in the eighth. After a couple hitless games cooled off Lewis Baez, the right fielder came back with a strong 2-for-5 effort, notching a triple and two runs scored. Gilberto Jimenez had three hits out of the leadoff spot. Miguel Suero had a rare uneven performance, giving up five runs (four earned) in four innings, raising his ERA from 0.84 to 1.54 in 12 outings split between the two DSL squads. It was a tough day at the plate, as the Sox notched only three hits off a pair of Indi-Brew hurlers. Kleiber Rodriguez had the only extra-base hit, picking up his 11th double of the season. Starter Irvin Villarroel allowed three runs in five innings, striking out five and walking two. Player of the Day: CJ Chatham has had a solid 2018 comeback after an injury-plaged start to his pro career. The shortstop entered Tuesday's play with a .294 batting average, but was engulfed in a serious power outage, with only one extra-base hit in his last 25 games. The 2016 second-round pick delivered a home run and a double along with a single to boost his average above .300 and his slugging percentage by 21 points.